Congress leader Vikram Malhotra during party meeting on Thursday. JAMMU, Sept 6: President District Congress Committee, Jammu Urban Vikram Malhotra asked the party workers to expose the falsehood of BJP at the grass root level which sought mandate on false promises and unachievable slogans besides divisive agenda. He said that the people have identified the real face of BJP and would give them a befitting reply in the forthcoming ULB elections and future elections in the state. Malhotra was speaking in a series of meetings of Congress workers in ward number 30, 33, 40 of Jammu West, today. He said that the way people were being forced to come on streets against non-availability of basic amenities like drinking water, ration and power was an indication of the total failure of the PDP-BJP Government”. He alleged that instead of solving peoples’ problems, it plunged the State into uncalled for controversies over issues which were no way connected either with governance or the much touted development. The unemployment was a huge challenge for the state and this problem contributes to the political uncertainty and unrest. Instead of taking concrete steps to provide means of livelihood to people, they neglected it completely. 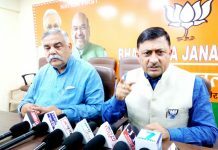 He said all the important projects of Jammu region whether it is Jammu AIIMS, Smart city, artificial lake project, the Chenab water supply scheme, construction of the Rehari Chungi- Jewal Chowk flyover, ring roads are lying unattended. Malhotra said that PDP-BJP Coalition Govt. failed to conduct Urban Local Body and Panchayat elections when formation of ULBs were must to empower the people of urban areas and added that in a democratic system it was necessary to make representative character of all democratic institutions to ensure people’s participation in these institutions. The priority of this regime was not to empower people by strengthening democratic institutions but those at the helm of affairs wanted to accomplish their nefarious designs by controlling such institutions through undemocratic means”, he maintained. He said that voters are now well aware of sheer opportunism of BJP & PDP and will show them mirror of their misdeeds. Manmohan Singh, Dr RK Khajuria, Gourav Chopra, Manmohan Sharma, Pawan Dev Singh, Babu Singh, Chaman Lal Angrall and others also attended.